If you live in the Western Hemisphere, for the most part, you have your choices of fruits and vegetables from all over the world. You can snack on fruit from North America or Asia, vegetables from South America or Africa, and, depending on where you live, you can even have them delivered to your door. With that in mind, maybe you should try adding something new to your diet, or something that you haven’t given much thought to. Like dates. Dates have often been called “nature’s candy” because they are sweet and bite-sized. But, have you ever taken a look at the benefits of dates? Did you know that they are a good source of important vitamins, minerals, fiber, and carbohydrates? Dates health benefits extend beyond nutrition. In this article, we’ll take a look at not only the benefits of dates, but also the side effects of dates. The health benefits of dates are, quite frankly, amazing. For the size of a date, there’s a large amount of good that it can do for your system. Nutritionally, dates are filled with advantages. But, dates also have a lot of other health benefits that may not be known to you. Dates are great sources of fiber. One pitted date can provide you with 6 percent of your daily dietary fiber requirements. Dates are also considered to be a great natural anti-inflammatory food as they contain a fair amount of magnesium, and studies indicate this mineral has the ability to reduce inflammation throughout the body. One pitted date holds 3 percent of your daily magnesium needs. Dates could also act as a natural laxative due to the fiber content of the fruit. If you want to get the most bang for your buck in this regard, soak the dates in water until a syrupy liquid forms and consume the whole concoction. Because of the high quantity of minerals found within (iron especially), dates are a fruit that may be well suited to aid those who suffer from anemia. Despite the “nature’s candy” label, dates are a decent food to add to your diet if you are trying to gain weight in a healthy way. Dates are high in fiber, which can help fill you up and stop you from snacking, but they also have a good amount of protein that can help build muscle. There is some evidence that points to dates as a food that could help reduce your risk of stroke due to the magnesium content. Experts believe that the mineral’s blood pressure-lowering ability may contribute to the decreased risk. If you are feeling run down and need a little boost in energy, dates may be the perfect snack as they are in natural sugars like sucrose, glucose, and fructose. Not only are dates useful as a laxative, but they may also help promote good bacteria growth in your stomach, which can help ease digestion. The fiber in dates could also help with issues like diarrhea, as it can help firm up stool. 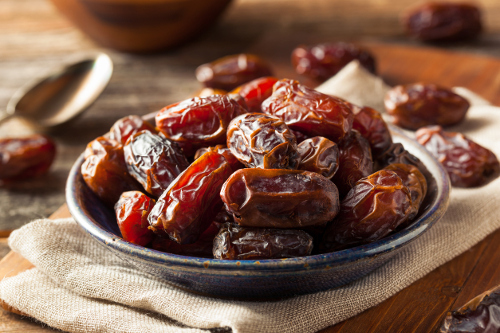 It may be slightly unexpected, but dates could potentially help boost the health of your bones and defend them against diseases like osteoporosis. Dates are great for bone health due to the minerals selenium, copper, magnesium, and manganese. As mentioned above, magnesium has been shown as useful for lowering blood pressure, and dates have a decent amount of magnesium. Dates also contain potassium, which can be helpful in keeping the circulatory system running smoothly and, in turn, help keep blood pressure low. Dates contain a solid amount of antioxidants, which scientists believe are used by the body to help protect cell structure from the damage of free radicals. This could help the body defend itself from various forms of cancer (breast, lung, colon, prostate, and pancreatic), as well as help your skin guard against the effects of aging. As you can see, the benefits of date fruit are pretty vast for something so easily snackable. But like many things that are that good for you, there are a few drawbacks and side effects that you should be aware of before adding dates to your diet. Dates are a great food for your health. They contain multiple vitamins and minerals that can boost and maintain the health of your body in various ways. Unfortunately, there may be some downsides of dates that you should know about. While dates can be a great natural pick-me-up due to their sugar content, that same sugar content can be an issue for others, especially diabetics who have to keep close tabs on their blood sugar levels. Dates are small, tasty, and very nutritious, but they also carry a good amount of calories. In fact, 1/4 cup of Medjool dates has approximately 111 calories. If you are trying to lose weight or maintain weight loss, you may want to consider that when eating dates. The truth is that some people are just allergic to things for unknown reasons, and dates are no exception to that rule. Date allergies tend not to be life threatening, but they can be serious enough to cause discomfort and other issues. While the digestive benefits of dates are great and will cause no issues for most people, in others, the fiber and other digestion-related content may produce a bad reaction in the stomach and cause issues like diarrhea. The side effects of dates are important to consider when adding them to your diet. If you are truly concerned about how dates in your diet will affect you, discuss with your doctor whether these fruits are right for you. Dates are a fruit that gives a lot of good for very little bad. As you can see, dates benefits and date nutrition for your digestive system and overall health are pretty phenomenal. They could help you with everything from digestion to cancer. But there are some drawbacks. In adding everything together, the best course of action when it comes to dates is moderation. Use them as a health booster rather than making them the centerpiece your whole diet. And when in doubt, contact your doctor or nutritionist. They will advise you of how many dates are helpful, and how many dates may start to cause problems if you are eating them on a regular basis. Volpe, S., “Magnesium in Disease Prevention and Overall Health,” Advances in Nutrition, May 2013, vol. 4: 378S-383S; doi: 10.3945/an.112.003483, last accessed May 8, 2017. Nierenberg, C., “Magnesium-Rich Foods May Lower Stroke Risk,” WebMD, January 20, 2012; http://www.webmd.com/stroke/news/20120119/magnesium-rich-foods-may-lower-stroke-risk#1, last accessed May 8, 2017. Price, C., et al., “Essential Nutrients for Bone Health and a Review of Their Availability in the Average North American Diet.” The Open Orthopaedics Journal, 2012; 6 (2012): 143–149; https://www.ncbi.nlm.nih.gov/pmc/articles/PMC3330619/, last accessd May 8, 2017. “13 Amazing Benefits Of Dates,” Organic Facts, https://www.organicfacts.net/health-benefits/fruit/health-benefits-of-dates.html, last accessed May 8, 2017. Barrett, M., “Health Benefits Of Dates – Promoting Heart, Brain, And Digestive Health,” Natural Society, March 5, 2013, http://naturalsociety.com/health-benefits-of-dates-7-reasons-eat-date-fruit/, last accessed May 8, 2017. “Dates Nutrition Facts,” Nutrition and You, http://www.nutrition-and-you.com/dates.html, last accessed May 8, 2017. Saba, “21 Amazing Health Benefits Of Dates (Khajoor) For Skin, Hair, And Health,” Style Craze, February, 20, 2017, http://www.stylecraze.com/articles/top-10-health-benefits-of-dates/#gref, last accessed May 8, 2017. Nandy, P., “10 Dates Benefits: From Improving Bone Health to Promoting Beautiful Skin,” Smart Cooky, July 19, 2016, http://food.ndtv.com/food-drinks/10-dates-benefits-from-improving-bone-health-to-promoting-beautiful-skin-1258714, last accessed May 8, 2017. Dannie, M., “The Side Effects of Date Fruit,” Livestrong, July 04, 2011, http://www.livestrong.com/article/484852-the-side-effects-of-date-fruit/, last accessed May 8, 2017.